Gettysburg National Military Park, Pennsylvania. On July 3, 2013, well-known military historian Eric Saul, former curator of the Military Museum at the Presidio of San Francisco, and his wife, Dr. Amy Fiske, Associate Professor of Psychology at West Virginia University, Morgantown, West Virginia, arranged the reading of the names of 10,211 soldiers who were killed in the three-day Battle of Gettysburg at the Gettysburg National Military Park (GNMP). The program was sponsored by West Virginia University, the Eberly College of Arts and Sciences, in cooperation with the Department of History. This event was part of the sesquicentennial commemoration that culminated in the reenactment of the Pickett’s charge that afternoon. The program began at 9:00 a.m., attended by a large audience, with opening remarks by Saul, the presentation of Union and Confederate colors, and followed by, for the first time ever, the reading of names of both the Union and Confederate soldiers. This reading was interspersed by the Gettysburg Address, the singing of civil war songs, and speakers who discussed the battle. Dr Amy Fiske. Photo by Eric Saul. Program was held at the base of the New York State Monument at Gettysburg, located in the Soldiers National Cemetery just steps away from the spot President Abraham Lincoln delivered his famous three-minute address. Taking turns, the names were read by officials of the Program, Superintendent of GNMP Robert Kirby, casual park visitors, relatives of soldiers who fought at Gettysburg, Civil War reenactors, and representatives of veterans organizations including the Japanese American Veterans Association (JAVA). Some readers cried, some remarked on the terrible cost of American lives, one woman said every name on the list was “someone’s darling.” Terry Shima, veteran of the 442nd Regimental Combat Team of World War II and JAVA representative, noted that it was a privilege and honor to link Asian Pacific Americans, including Japanese Americans, to this historical event. Eric Saul, who has curated exhibits on the Nisei Soldier, invited Mr. Shima to represent Asian Pacific American veterans in this program. Saul said, “It was an honor to have a representative of the 442nd Regimental Combat Team, representing Asia Pacific American World War II veterans to honor the Gettysburg dead. The 442nd was one of the most decorated US military units of all time.” Saul said, “It was moving to see one generation honor their predecessors.” Saul’s interest in military history started when he was 13 years old, when he visited a Civil War Centennial exhibit at the Los Angeles County Museum of Natural History in 1963. Saul said it was meaningful for him to be able to link his interests in the Civil War and Japanese American history. Abigail Bingham Endicott and Eric Saul at Gettysburg Military Park. Photo by Eric Saul. Vocalist Abigail Bingham Endicott of Bethesda, Maryland, sang a medley of Civil War songs, including one she composed for this occasion entitled “Friend to Friend,” the title of which was taken from a Free Mason’s monument. The monument featured Confederate Brigadier General Lewis Addison Armistead and Union Captain Henry Harrison Bingham, staff assistant to Major General Winfield Scott Hancock. The statue shows Confederate Armistead passing his pocket book, watch chain, seal and spurs to Bingham to entrust them with his Union General friend, Hancock. Endicott visited the Mason’s monument, where she again sang “Friend to Friend,” which was written for and dedicated to her first cousin three times removed, Captain Bingham and the two generals, who fought on opposing sides but were close personal friends to the very end. Captain Bingham, a Medal of Honor recipient, would rise to the rank of general and, following his military service, would spend 30 years as a member of the US House of Representatives, where he was referred to as “Father of the House.” [Anyone who wishes to receive free of charge the lyrics to Friend to Friend should contact Terry Shima (ttshima@comcast.net or 301-987-6746). The list of names of the Union and Confederate soldiers killed in action, never prepared in this manner before, was collected, sorted and typed by Saul and Dr. Fiske. 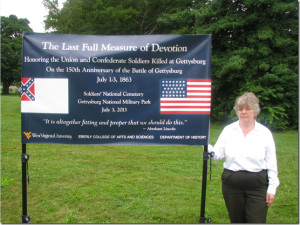 This event was significant for Dr. Fiske because her great great great uncle, Major General Henry Warner Slocum, was the second ranking general at Gettysburg. He commanded the right wing of the Union Army, which defended Culp’s Hill, a strategic location for the flow of equipment and supplies to Union forces. 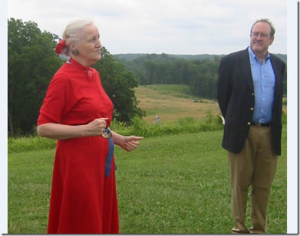 On July 2, Dr. Fiske met reenactor Dave Bonham, dressed in Civil War regalia as Major General Slocum, at Culp’s Hill, where Bonham described the battle and Slocum’s role. Also participating were Mike Doyle, depicting General Oliver O. Howard, and Paul Bourget, depicting General George S. Greene. Slocum, a West Point graduate, was one of the youngest generals in the Union Army who also fought at Bull Run, South Mountain, Antietam, Fredericksburg, and Chancellorsville, and was co-deputy commander of Sherman’s March to the Sea. Following the completion of the reading at 7:00 p.m., the list of the soldiers killed-in-action was presented to the Gettysburg National Military Park. Park Superintendent Kirby said that the reading of the names will become an annual event at Gettysburg.